Yes. There will be tentacles. The CD packaging project I mentioned earlier has been on hiatus through the holidays – until all its text has been massaged and tickled to perfection – so in the meantime I’ve been working away at the future illustrations for The Lair of the Clockwork Book. By the time I have to switch back to the CD I hope to have lots of pages ready for you in the buffer. Well, I say lots; there are already enough illustrations done to see you through sometime in February, but I want as many done as I can manage by the time I have to switch projects again because that Clockwork Book buffer is an unforgiving beast… and these are mostly pretty challenging illustrations. With all of that on my plate I haven’t had a chance to work on the serial that will follow The Lair of the Clockwork Book. In fact I’m so disappointed with my progress on the other story – Part Two of The Toaster With TWO BRAINS – that I’m certain that something is going to have to change in the near future; I’m just not positive exactly what is going to change, and how, or when. It’s a mystery. I’m sure we’ll all find out what that means, eventually. 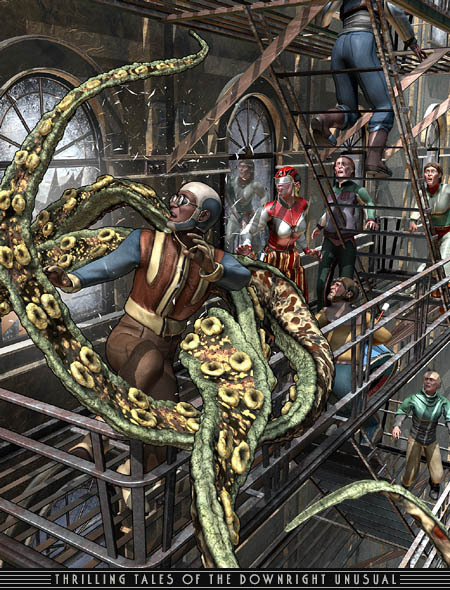 But until then… at least we have tentacles. Badass Digest has dug up the very first appearance of Buck Rogers on the movie screen in a short film produced for the 1933-34 Chicago World’s Fair that you can now view in all its rough-hewn glory. Notable is the space battle, featuring bunches of miniatures that could just be the same toy rocket ships that were part of the Buck Rogers merchandising empire. Here we see Doctor Huer, musing at some (interminable) length about the mystery behind the attack of the Tiger Men of Mars. I think there may be a couple of mistakes in the accompanying text – for example, the Just Imagine rocket ship was reused in the Flash Gordon serials, and I can’t think of any sets or miniatures from that film that showed up in Buck Rogers. Though admittedly, I might also be wrong. It’s certainly true that all of these serials recycled some of the same sets and costumes that were warehoused and rented out after the collapse of the silent epics of the twenties. It’s the space battle that really stands out here: I was amused to find the same grinding propeller sound effects for the rockets that we heard a few years later in the serial – or was that Doctor Huer’s cosmic television tuner? – but all in all they didn’t do badly for a low budget effort from 1933.